The most versatile multi-laser platform available with direct emission laser handpieces, including: IPL 550nm/570nm/590nm for photo rejuvenation, vascular issues and 400nm for acne concerns. Intense Pulse Light (IPL) continues as the cornerstone of prescribed aesthetic skin treatments as a catch-all for a multitude of skin issues; namely vascular, pigmentation and acne concerns. Blood vessels visible on your skin, as well as facial flushes, vascular lesions and rosacea, can all be treated with IPL. Additionally, it is also proven to be successful when used against acne, post-acne hyperpigmentation, sun spots and photo aging. IPL wavelengths target chromophores such as melanin found in pigment and oxyhaemoglobin, found in blood vessels. By destroying the target with a laser IPL treats successfully without affecting or damaging surrounding tissue. The targeted cells are destroyed by the absorption of light and the transfer of energy. IPL is different from a laser because it uses multiple wavelengths rather than just one. It achieves rapid photo-rejuvenation by using these wavelengths to penetrate your skin at different levels to treat the targeted areas. This stimulates the production of collagen, a naturally-occurring protein that helps heal and revitalise the skin. The IPL device can be customised to suit your skin type and achieve maximum results as quickly as possible, but it is best suited to those with fair to light brown skin (skin types I-III). Sun and age spots, freckles and the general skin mottling that gives away our age or lifestyle can all be treated. Visible pigment is broken down layer by layer, exposing the clear skin underneath. When used against acne, IPL works to destroy the bacteria that cause the characteristic inflammations of this common and stubborn skin complaint. IPL is versatile enough to treat a range of other skin issues and can even be used for hair removal. If you want to find out more about our IPL treatment,arrange a consultation today. Multiple concerns can be addressed with IPL; acne, pigmentation and vascular issues. For this reason, IPL is the go-to treatment for skin uniformity and luminosity. What does the procedure IPL involve? A soothing gel is applied to the skin to help the laser hand-piece glide across the skin. 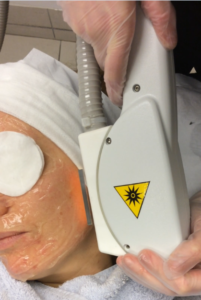 Eye-protection is applied and a flash of light is seen as the laser hand-piece passes over the skin. The pulses of light feel a little like having an elastic band snapped against your skin. This is slightly uncomfortable but not painful. You are likely to need a course of treatments to ensure optimal results from this treatment. The number required varies from one person to another and depends on the size of the area being treated, but we usually recommend a minimum of 3 treatments, spaced out at four-week intervals.